Julie:	They do offer things that other franchises don't do, I mean just literally paperwork. Some of the paperwork that we can get has saved me. Pete: I look at things as becoming the local authority in your marketplace. Not only do we dominate the local search ecosystem but I'm doing article marketing, video marketing, webinars, things like that that help build trust with the customer or the client so that basically when they look at that then we appear a lot times the person that's coming for an estimate has been in the webinar so it's instant recognition. Sharon:	We really like the marketing program. The marketing program is fantastic. That really drew us in and we knew that people would be attracted to that. Steve:	We pretty well adhered to the model and used the marketing suggestions they provided us. It's pretty well been right on track. Tom: Having the systems in place that takes it all the way through the followup of asking the right questions, how did we do. I think it really does because what's keeping us afloat right now are the repeat customers. Charlie: Corporate does a fantastic job in terms of meeting our needs. I think to me they still, even though we've grown over the years, still haven't lost that family type of feeling. Jim: I think it's a very good system. I still find it hard to believe that you can get a company up and running and have full marketing support, full brochures for what's required to start up. I think overall for a startup company I think it's phenomenal. 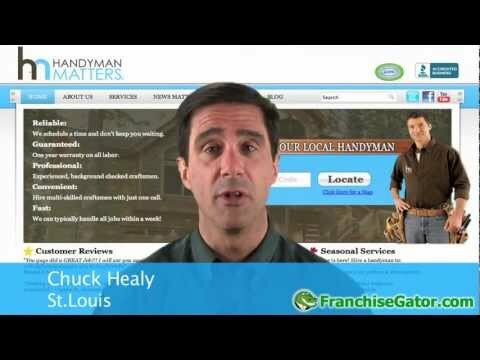 Handyman Matters is currently accepting inquiries from the following states: Wyoming, West Virginia, Wisconsin, Washington, Vermont, Virginia, Utah, Texas, Tennessee, South Dakota, South Carolina, Rhode Island, Pennsylvania, Oregon, Oklahoma, Ohio, New York, Nevada, New Mexico, New Jersey, New Hampshire, Nebraska, North Dakota, North Carolina, Montana, Mississippi, Missouri, Minnesota, Michigan, Maine, Maryland, Massachusetts, Louisiana, Kentucky, Kansas, Indiana, Illinois, Idaho, Iowa, Hawaii, Georgia, Florida, Delaware, Washington, D.C., Connecticut, Colorado, California, Arizona, Arkansas, Alabama, Alaska.